I’m not a foodie, but I love the Food Network show “Chopped”. Like as in the stay up until two in the morning marathon watching random episodes on a Tuesday night kind of love. What I love about “Chopped” isn’t so much the actual cooking. Don’t get me wrong – it’s really fun to see top chefs try to brainstorm an appetizer using goat cheese and fruit roll ups in just 20 minutes. But if I just wanted to see people cook random and ridiculous items, I’d watch Epic Meal Time on Youtube. What I love about “Chopped” is the honesty of the judges. I really think the judges are the most honest in all of reality television. 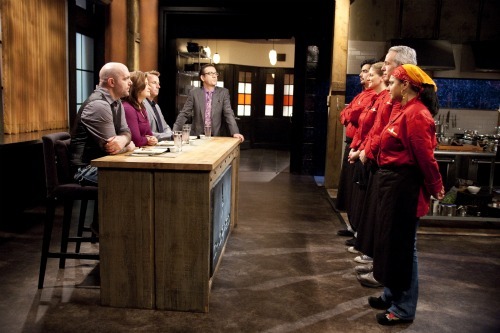 No matter how talented the chefs competing are, it’s nearly impossible to make a perfect meal in 20 or 30 minutes they are given on the show. The judges on “Chopped” are quick to point this out. Every plate has something imperfect on it – the temperature, the portion size, the taste, the texture. Even the best dishes never satisfy all three judges. Honesty makes for compelling television. If the judges just gushed about how amazing each contestant was, well, then it would just become “American Idol”. Being nice to everyone is boring. Nobody is perfect. We all have room to grow in the kitchen and in life. Just recently I watched an episode where the “Chopped” judges actually competed on the show. Even then these master culinary artists still produced flawed dishes. The more open we are to constructive criticism, the more we will grow. Every contestant who makes it through to another round on “Chopped” ends up a better chef because of the honesty of the judges who told them what needed to improve. Everyone could use an honest judge. We’d all be better off with unfiltered friends in our life who are willing to point out our flaws in a helpful manner. If you don’t have friends who are honest with you, they’re not really being your friends. A good friend helps you grow. Blind loyalty doesn’t help anyone. Be honest with yourself. You’re not perfect. That’s no reason to be upset. It just means as long as you’re alive you’re not done yet. Get back in the kitchen. Look at the things you need to fix and start chopping away at them, one by one, as you work on the next dish. Don’t get overwhelmed. Even if you lose, there’s always a new episode tomorrow. Do you have an honest judge in your life? How has honest and constructive criticism helped you grow?